Somethings jump out at me when I'm in Taipei, There are some US brands that are all over the place. I read some where that Taiwan has the highest number of 7-11s per capata. Near my office there is a place where there are two 7-11s across the street from each other. 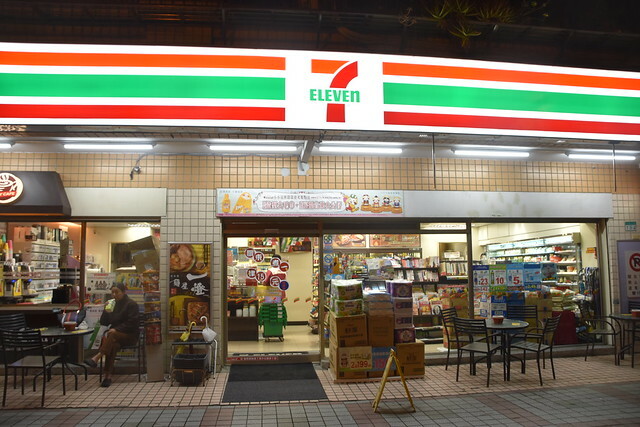 My co-worker told me the 7-11s in Taipei are based off the 7-11s in Japan, not the 7-11s in the US. What I didn't know before is 7-11 is owned by a Japanese holding company now. There are a lot of convence stores in Taipei. In future visits I need to visit more. Starbucks are also big in Taipei. There are some other coffee outlets we don't have in the US. The coffee menu is like the US menu. I like they do not add sweetener to iced coffee as a default. I have stopped to at eight different Starbucks in Taipei without going out of my way. They usually have a good crowd at them. The food menu is different. It seems to be more targed to lunch and have fewer pastries. They do not have as many low carb options. It makes it easier for me to avoid eating when I'm there. A couple of time I've almost at at a McDonalds in Taiwan. I could not bring myself to pass up the other choices at Taipei 101. Maybe I need to go the one near the office some time. I wonder if the hamburgers taste different. Maybe next time. In the parts of Taipei I've been in, it seems like more than half the cars on the road are Toyotas. It seems like all the taxis are Toyotas. You see almost no American cars on the roads. I saw a few Fords, an Opel, that is about it. No other GM or Chrysler/Jeep. Mazda seems to be the second biggest car brand.